A new study of just about every aspect of the individual soldier’s performance is underway at Fort Bragg, North Carolina with paratroopers of the 82nd Airborne Division. The study, called Monitoring and Assessing Soldier Tactical Readiness and Effectiveness, or MASTR-E, started in late May and is focused on studying several areas of performance-related measurements. Researchers with the Natick Soldier Research, Development and Engineering Center, or NSRDEC, are leading the study. Soldiers under the command of Lt. Col. Graham White, who heads the 2nd Battalion, 505th Parachute Infantry Regiment, 3rd Brigade Combat Team, or “Panther Brigade,” are part of the study. 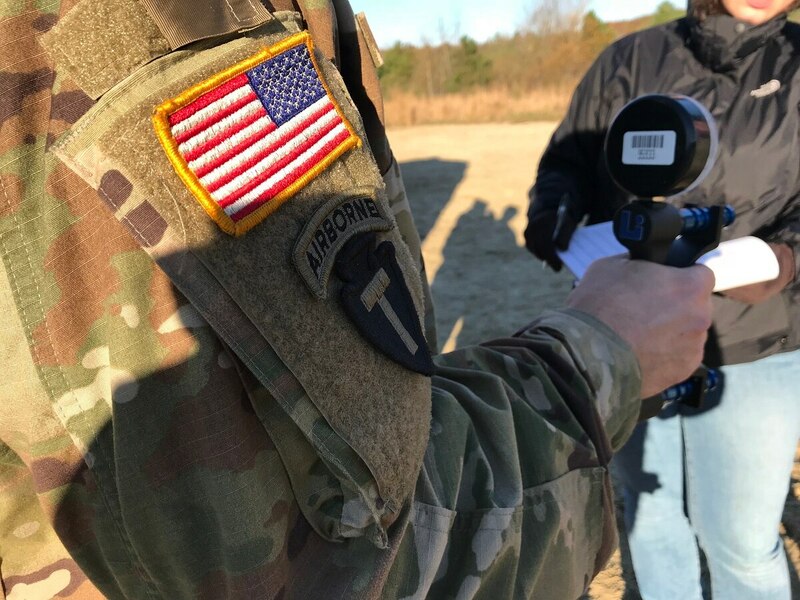 The smaller, lighter Laser Target Locator Module, or LTLM II, gives paratroopers a better way to use range and hit targets with artillery and mortars. “Though still in the preliminary stages of testing and development, our paratroopers are keenly interested in the long-term impacts of such a study on the health, physical, social-emotional and cognitive factors affecting sustained performance for the warfighter,” White said in a release. They’re taking three platoons in a 14-day field study and taking 210 measurements. It runs through the gamut of an operation from five days out of pre-mission planning followed by ongoing measurements during a 72-hour field mission and then five days of post-mission measuring. They’ll look at biomechanics, load carriage, performance nutrition, equipment use, injury reporting, navigation and recovery times, among other areas. Of course, cognitive performance will be tracked closely alongside the other biological markers. “We’ll evaluate the impact of long-term fatigue and duress, incurred during extended training exercises, on cognitive performance, including how Soldiers make decisions on what to eat, where to go, or how they remember information pertinent to their mission,” Dr. Erika Hussey, a research psychologist on NSRDEC’s Cognitive Science Team, said in a release. This was brought about in part by the 82nd Airborne Division commander, Maj. Gen. Erik Kurilla, and his interest in finding solutions to performance problems. Col. Phillip Kiniery, his staff and company commanders submitted a white paper on those exact problems to the NSRDEC staff that led to the two entities partnering in the study, according to the release. The performance measures are not simply a way to make soldiers more comfortable but also more lethal. But, Hussey cautioned there is a lot of work between taking training measurements and applying them in an operational context. “We’ve linked up with some incredible researchers Armywide and beyond who are excited to bring their respective scientific questions to the field to shape future lab efforts based on what we learn about Soldier performance during sustained training exercises,” Hussey said. But other organizations are contributing to the study and analyzing the data that will come from the experiment. Those include the Army’s Aberdeen Test Center, Research Institute of Environmental Medicine, Walter Reed Army Institute of Research, Edgewood Chemical Biological Center, the U.S. Military Academy at West Point, the Army Research Institute, the Center for Applied Brain and Cognitive Sciences, and Tufts University.